There is a lot of evidence that dogs feel emotions. A study providing an important insight into dogs’ emotions suggests that at least some dogs who show separation-related behaviour may have underlying negative emotional states. Just like us, dogs can tend to be optimistic or pessimistic. Many dogs become distressed when left home alone, and they show it by barking, destroying things, or toileting indoors. A study gained new insight into the minds of dogs by discovering that dogs that are anxious when left alone also tend to show ‘pessimistic’ like behaviour. Professor Mike Mendl, Head of the Animal Welfare and Behaviour research group at the UK’s Bristol University, who led the research, said: “We all have a tendency to think that our pets and other animals experience emotions similar to our own, but we have no way of knowing directly because emotions are essentially private”. 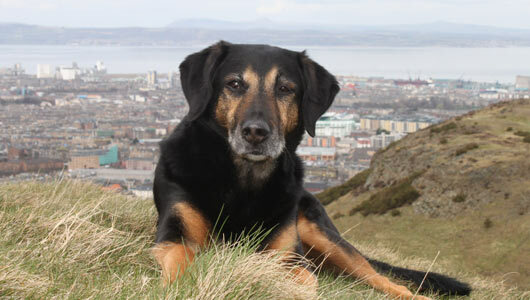 However, his research team was able to develop a new method to study ‘pessimistic’ or ‘optimistic’ decisions in dogs. The researchers conducted the study with 24 dogs that had recently entered a re-homing shelter in the UK. Each dog was first tested for separation anxiety-related behaviours. A researcher interacted with each dog in an isolated room for 20 minutes. The following day, they took the dog back to the room and then left it alone for a period of five minutes while its behaviour was captured on video. In those five minutes, the researchers observed barking, jumping on furniture, scratching at the door, and repetitive behaviours to varying extents depending on the dog. The dogs that made more ‘pessimistic’ judgments about whether they would find a food bowl empty or full also expressed more separation-related behaviours. The results suggest that behaviour regarded as ‘problematic’ for owners also has emotional significance for the animals concerned, even when the behaviour itself isn’t being expressed, the researchers concluded. Mendl says the results also suggest that ‘optimistic’ versus ‘pessimistic’ decision-making may be a valuable new indicator of animal emotion. A similar study was conducted at the University of Sydney, you can learn about their findings in the video below! The findings also raise the possibility that some dogs may be more prone to responding anxiously when left alone than others, and that this is related to their general mood. That’s important because “separation-related behaviour is common in dogs, so predicting which dogs may develop this, and treating them appropriately, is very important for ensuring good dog welfare.” Mendl said. People should be encouraged to seek treatment for these dogs to enhance their welfare rather than give them up for re-homing. Other studies have suggested that dogs can experience negative emotions in a similar manner to people, including the equivalent of certain chronic and acute psychological conditions such as depression. In 1965 Martin Seligman from the University of Pennsylvania conducted highly unethical experiments into a condition known as ‘learned helplessness’, as an extension of his interest in depression. The distressing experiments involved giving dogs electric shocks and showed that when dogs learned that nothing they could do could stop the shocks, they effectively gave up trying to escape and suffered chronic symptoms of clinical depression as a result of this perceived helplessness. A further series of experiments showed that, similar to humans, under conditions of long term intense psychological stress, around a third of dogs do not develop learned helplessness or long term depression. Instead these animals somehow managed to find a way to handle the unpleasant situation in spite of their past experience. The same characteristic in humans has been linked with an optimistic attitude. In more recent years, symptoms analogous to clinical depression, neurosis and other psychological conditions have been in general accepted as being within the scope of canine emotion. Scientists in Austria found that dogs are capable of feeling jealous . They showed that dogs will stop doing a simple task when not rewarded if another dog, which continues to be rewarded, is present. The experiment consisted of taking pairs of dogs and getting them to present a paw for a reward. On giving this ‘handshake’ the dogs received a piece of food. One of the dogs was then asked to shake hands, but received no food. The other dog continued to get the food when it was asked to perform the task. The dog without the reward quickly stopped doing the task, and showed signs of annoyance or stress when its partner was rewarded. “Dogs show a strong aversion to inequity. I would prefer not to call it a sense of fairness, but others might.” said Dr. Range who conducted the study. This kind of behaviour, where one animal gets frustrated with what is happening with another, has only been observed in primates before. Studies with various types of monkeys and chimpanzees show they react not only to seeing their partners receiving rewards when they are not, but also to the type of reward. Researchers believe that dogs show empathy. Empathy is feeling what others feel. Empathy is the ability to not only detect what others feel but also to experience that emotion yourself. Dr. Peter Pongracz from Eotvos Lorand University, Budapest, and colleagues have produced evidence that dog barks contain information that people can understand. Their research suggests that even people who have never owned a dog can recognise the emotional ‘meaning’ of barks produced in various situations, such as when playing, left alone and confronted by a stranger . They found that people can correctly identify aggregated barks as conveying happiness, loneliness or aggression. Pongracz said even children from the age of six who have never had a dog recognize these patterns. This is evidence that barking conveys information about a dog’s mental state. The researchers developed a computer program that can aggregate hundreds of barks recorded in various settings and reduces them to their basic acoustic ingredients . Researchers have stated that each of the different types of bark has a distinct pattern of frequency, tonality and pulsing, and an artificial neural network can use these features to correctly identify a bark it has never encountered before. OneKind is firmly opposed to any experiments using animals that causes them pain or suffering. Where such experiments increase our understanding of animal sentience, we will report them in the long term interest of all animals. The more scientific evidence we have of the capacities of other animals as sentient creatures the stronger our case for re-evaluating our relationships with them to benefit us all. Mendl M, Brooks J, Basse C, Burman O, Paul E, Blackwell E and Casey R 2010 Dogs showing separation-related behaviour exhibit a ‘pessimistic’ cognitive bias. Current Biology 20, Issue 19, 39-40. Seligman M. E, Maier S. F and Geer J.H 1968 Alleviation of learned helplessness in the dog. Journal of Abnormal Psychology, Volume 73, Issue 3, Part 1, 256-262. Range F, Horn L, Viranyi Z, and Huber L 2008 The absence of reward induces inequity aversion in dogs. Proceedings of the National Academy of Sciences. Pongracz P, Molnar C, Miklosi A and Csanyi V 2005 Human Listeners Are Able to Classify Dog (Canis familiaris) Barks Recorded in Different Situations. Journal of Comparative Psychology Vol. 119, No. 2, 136–144. Molnár C, Kaplan F, Roy P, Pachet F, Pongrácz P, Dóka A and Miklósi Á 2006 Classification of dog barks: a machine learning approach. Animal Cognition, Volume 11, Number 3, 389-400.